At a lengthy and sometimes confusing board meeting in Oakland today, BART's board of directors decided to delay approval of various security measures while allowing several others to move forward. The most controversial proposal that was delayed involves building a powerful surveillance system that will use video analytic software to review digital footage from thousands of cameras on trains, in stations, and around parking lots. If approved, the multi-million dollar project would be one of the largest surveillance systems of its kind in the Bay Area, watching over several hundred thousand people who move about BART each week. But other board members were more concerned about giving suburban communities a greater voice about whether to move ahead with the project, especially since most members of the public who spoke at today's Oakland meeting were strongly opposed. The district already has over 4,500 cameras, most of which are old analog models that don't easily lend themselves to being incorporated into a surveillance system that uses computer programs to automatically analyze footage. Directors gave the go-ahead today for staff to work on a plan to replace many of these old cameras with new digital types, but the board must vote again on whether to allow spending money on the replacement project. At the Lake Merritt Station, BART is already testing software that can, without any human assistance, identify suspicious packages or alert police when someone jumps a turnstile without paying. The district's police and administration insisted at today's meeting that they do not intend to pursue controversial capabilities like facial recognition or audio collection at this point in time, but so far they've declined to provide specific details about the capabilities of the technology being considered. Many speakers at today's meeting accused the BART police and management of trying to "exploit" the Nia Wilson tragedy to push through the controversial surveillance project. They said increasing surveillance and policing will likely lead to the further criminalizing of people of color and the homeless. But BART directors from suburban areas in Contra Costa and Alameda County were very supportive of the surveillance proposal and other measures to increase police presence. "Unless I'm mistaken, there is no expectation of privacy in a public conveyance," said BART Director Joel Keller, who represents North Concord, Antioch, Pittsburg, and Bay Point. Keller said he wants action fast on the surveillance system and is frustrated at delays. Keller said the attendees at today's board meeting were only presenting half the story. 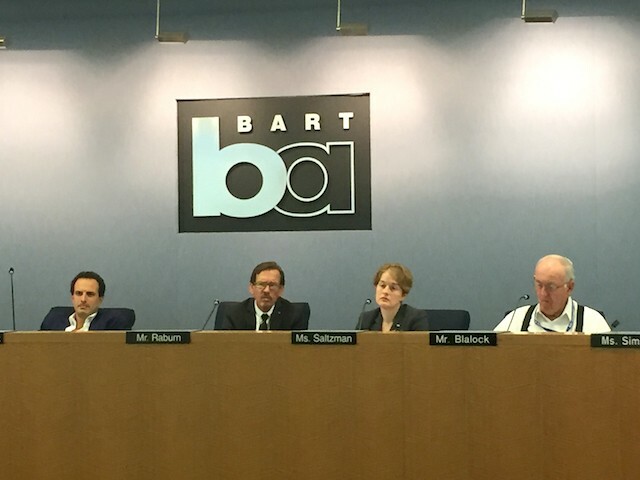 He insisted that BART should hold an evening board meeting in a suburban city to gather input from riders who will support the surveillance plan, in addition to hiring more police, cracking down on fare evasion, and banning panhandling. "We haven't heard from the frightened riders who are reluctant to use our system," he said. "We have heard the concerns of people who live in the urban core." Director John McPartland, who represents Castro Valley, Dublin, Pleasanton, and Hayward, echoed Keller, saying he has constituents who "don't feel safe," and that he's heard from mothers who won't let their kids right BART at anytime. "Nia's killer wouldn't have been caught if he wasn't caught on camera," said McPartland as he pushed for an immediate approval of the surveillance system. Allen also took opportunity to defend the BART police. "The whole attacking of the police force saddens me," she said. The board voted to convene a special evening meeting next month somewhere "east of the hills" in a suburb where the surveillance system can be discussed further and possibly voted on. The board plans to receive and vote on a final draft of the surveillance technology and privacy ordinance at its next regular board meeting, likely after the suburban forum.